I get a lot of questions about the Alaska Airlines companion fare provided each year you pay the annual fee on your Bank of American Alaska Airlines Visa Signature Card. Sometimes people come up with ideas that don’t make any sense to me, but then I’m usually a pretty straightforward guy when booking tickets. Feel free to be more creative — I’m used to it. On the other hand, I have tried enough test cases that I’m getting pretty good at predicting what will and will not work. So here’s my guide to everything I know about the companion fare. You can use the companion fare for just about any ticket involving travel on Alaska Airlines or Horizon Air. One way, round trip, open jaw, multi-city, whatever. You can use the companion fare for any ticket so long as there are no codeshares or partner flights. If you can book it without a companion fare–and all the segments are on Alaska or Horizon–then you can also book it with a companion fare. There are very few routing rules, which 99% of people will not encounter. I’ll get to that in a minute. You need to book economy class. A few years ago, Alaska removed the ability to use the companion fare on first class tickets. Some people think this was a huge blow. However, I find that upgrades are pretty easy to obtain. Update: As of late 2018, I’m no longer as confident that upgrades are easy to come by. They seem less frequent, and eligible fares are fewer. In particular, some flights operated by Virgin America’s Airbus fleet have very few first class seats that are almost never available for upgrades. You might consider settling for Alaska’s new premium economy instead, which still offers extra legroom and complimentary alcohol. The companion fare is just a discount code. The companion gets an ordinary ticket booked into an ordinary fare class, just like the primary traveler. The companion just pays less. Unlike most companion fares issued by airlines or credit card issuers, there are no blackout dates or special restrictions you need to worry about. There only need to be two tickets available. The bad news is that this means you can’t combine the companion fare with other discounts, such as customer care credits or birthday specials. All the usual rules apply. On your receipt, you can see the fare class purchased. If I booked a Y fare, then my companion will have a Y fare. If I booked a G fare, then my companion will have a G fare. It doesn’t matter that the companion paid less. Upgrades, changes, cancellations, and earning miles are all possible like with any other ticket. The companion is simply getting the same ticket as you for a lower price. You don’t need to book round-trip. Although the terms and conditions say the fare must be for round-trip travel, this isn’t strictly true. You can book one-way travel. You can book open jaws. You can book multi-city travel between completely different cities. I’ve confirmed that Austin to Seattle, Portland to Maui, and Honolulu to Sacramento — all on different dates — will qualify. Remember, you don’t have to enter the segments exactly as you fly them. Alaska only offers four segments in its multi-city search tool, which can be constraining. Use these wisely to force a stopover, but otherwise let the search engine find connecting cities on its own. You could enter AUS-PDX as one segment to force a stopover in PDX and pick a result that includes a connection (not a stopover) in Seattle. What you can’t do is book travel that is clearly not anything close to round-trip. In the example of AUS-SEA//PDX-OGG//HNL-SMF we flew west and then flew east. Kinda sorta maybe round-trip, even if we never hit the same city twice. 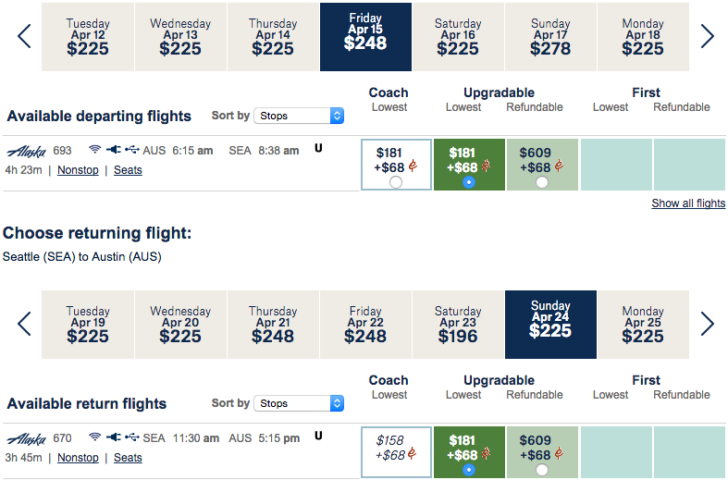 For an ordinary ticket, you can use the multi-city search tool to book something bizarre like AUS-SEA//SEA-OGG//AUS-PDX, flying west twice in the same ticket. However, trying to apply a companion fare to this itinerary will return an error. You can book any fare class within the economy cabin. You can book G, L, K, Y, B, M, or any other fare class. Keep this in mind if you want to upgrade as upgrade rules vary with the fare class you purchase. The companion will still pay $99. If the difference between the cheapest fare and an upgrade-eligible fare is $50, then only the primary traveler needs to pay it. The companion still pays $99. You can change your ticket as much as you want. If you change your mind you can change your reservation to completely different cities and dates while keeping the companion fare intact. You can also re-fare your ticket into a more expensive fare class that makes you eligible for an upgrade. I screw this up all the time and often book cheap fares that are ineligible for instant upgrades, so I have to call back (or go online), and pay an extra $10 or $20 to become eligible for a Gold Guest Upgrade or instant MVP Gold upgrade. You cannot cancel your ticket without losing the companion fare. Alaska has a pretty generous cancellation policy. MVP Gold and 75K elite members can change their ticket at any time without penalty. (This benefit does not carry over to non-elite and regular MVP members in the same reservation; they need to pay $125.) However, canceling a ticket will lose the companion fare discount. I strongly recommend you change the ticket instead. The same fees apply either way. Because my wife and I are both MVP Gold members, if we don’t know when we’re going to use it, we will change the ticket to something fare out in the future and change it again when we make up our mind. You can do this, too, without status as long as you get a large enough discount to make up for the change fees. I once used a companion fare to go to Dallas, changed my mind, and rebooked it to San Francisco for some far out date. San Francisco is cheap, so the extra funds went into MyWallet. Then when I decided what I was going to do I rebooked it for Maui and took those funds right back out of MyWallet to pay the difference since Hawaii is more expensive. You can get more than one companion fare. My wife and I each have several companion fares because we each have several Alaska Airlines credit cards. We currently get four per year. I know friends who get more, but this is enough for me. You might want to consider staggering your card applications so you get the companion fares at different times. The success of this approach has changed over time. Bank of America implemented the so-called “2/3/4 rule” in 2017. That limits approvals to two cards every two months, two cards every 12 months, and four cards every 24 months. It’s pretty manageable (one card every six months is still pretty good), but others have reported more difficulty getting approved as of early 2019. You don’t need to be the primary traveler. In general, you do need to be on the reservation if you’re using your companion fare, but you don’t need to be the primary traveler. We almost always try to make me the primary traveler when my wife and I travel together. This is because I almost never cancel a trip, while sometimes things do happen in her life. If the primary traveler doesn’t show up at the airport, the companion won’t be allowed to fly. You’ll be able to choose who is the primary traveler and who is the companion when you get to the passenger information page. Choose anyone as the primary passenger. Right now it’s my wife because she’s logged in. You don’t need to book through your account. The system is smart enough to tell if you’re on the reservation even if you aren’t logged in through your account. If I want to use the MyWallet funds I have left over from a low fare guarantee or a canceled trip, we need to book through my account (or her account if she has the MyWallet funds). We can still use my wife’s companion fare. I first log into her account, retrieve the coupon, and then log into my account. The coupon is just a code that you can enter when beginning a search. You don’t even need to travel at all. If you aren’t going to be on this trip, you can still redeem your companion fare for two other people as long as you’re the one who pays for it. This also makes it easier to redeem multiple companion fares if you are traveling with a family. Just remember you’ll need to make separate reservations, and it’s probably smart to pair up children with adults. For example, I recently moved to Austin (as of 2018) and don’t get to fly Alaska Airlines as much as I would like. I still use them for trips back to Seattle, to see my family in California, and for our annual vacation in Hawaii. But I could also use my companion fares for my sister and her boyfriend to visit us, or for my sister and brother in law to join us in Hawaii. You can use the companion’s Gold Guest Upgrade codes. This last bit is getting off-tangent, but I do like to redeem Gold Guest Upgrades when redeeming a companion fare. If we book the trip while logged into my account, I’ve already explained that we can still use my wife’s companion fare (assuming she’s traveling) and choose either person as the primary traveler. Whose account you’re logged into only really matters for accessing MyWallet funds and applying Gold Guest Upgrades. You don’t have to use your own Gold Guest Upgrades. At the end of the reservation, after paying, it will ask if you want to apply a Gold Guest Upgrade. Say “yes” but don’t select any segments to upgrade. Keep the confirmation number, log out, log into your companion’s account, and add the reservation using the last name and confirmation number. You should be able to make a new Gold Guest Upgrade request using the companion’s upgrade codes. Discount: Valid for one annual Companion Fare from $121 (USD) ($99 base fare plus taxes and fees from $22 depending on your Alaska Airlines flight itinerary) when traveling with another passenger on a paid airfare. Valid for coach class only. Both passengers must be booked in the same itinerary, at the same fare, traveling together, and ticketed at the same time. Valid for round-trip or one-way travel. Multiple stopovers not allowed. Valid on published fares. Valid on published fares. Not applicable to Mileage Plan Award Reservations, Alaska Airlines Vacation packages, tour or contract fares. Reservations & Ticketing: Valid for new ticket purchases through alaskaair.com or EasyBiz. The Companion Fare Discount Code is redeemed at time of ticketing and is void for future changes or purchases. Traveler and/or Purchaser name must match the name issued on the Discount Code. Credit card required for purchase. Passengers: Valid for one Companion Fare when traveling with a second passenger on a paid fare, traveling together, and booked and ticketed at the same time in the same reservation. Flights: Valid only on flights operated by Alaska Airlines and flights operated on behalf of Alaska Airlines by Sky West and Pen Air. Not valid on codeshare flights. Taxes, Fees and Surcharges: Passenger is responsible for all applicable taxes, fees, and surcharges, including checked baggage fees. Combinability: Not valid with any other discounts, including Discount Codes, My Account online discount, coupons, discount programs, or other arrangements. Changes and Refunds: Changes and refunds are allowed per the applicable fare rule and may result in the forfeiture of the Discount Code. Transferability: Discount Codes and tickets are not transferable. They may not be given to another individual, and may not be sold, bought, bartered, auctioned or collected in bulk. Any deemed by Alaska Airlines to have been distributed or acquired improperly will not be honored and traveler will be liable for payment of full fare. Additional Terms: All rules of Alaska Airlines , alaskaair.com, and the applicable fare rules not mentioned within these terms and conditions apply. Other: Lost or stolen Discount Codes or tickets cannot be replaced. Alaska Airlines has the final authority regarding redemption. Travel is subject to Alaska Airlines contract of carriage. Terms and conditions as written herein are final and cannot be changed by any statement or representation of any unauthorized person, including employees of Alaska Airlines or issuing organization. Other restrictions may apply and Alaska Airlines reserves the right to suspend or change this offer without notice.